The route between Dumaguete and Siquijor is becoming popular as more and more tourists have discovered the hidden gems of the Island of Fire. You can go to Siquijor from Dumaguete via fast craft or roro boat. There is no airport in Siquijor. 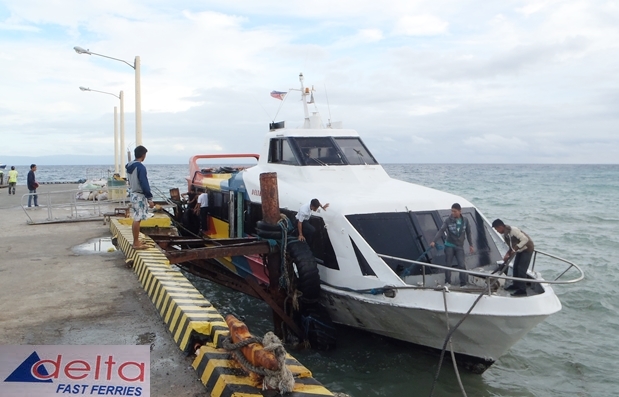 The fast craft that cruises between these two Visayas hubs is Delta Fast Ferries. You can find the booking office of Delta Fast Ferries at Pier 3 in Dumaguete City, Negros Oriental. In Siquijor, this shipping line’s location is at PMart. Unfortunately, Delta Fast Ferries does not have an official website that we could find. If you know this fast craft website, kindly advise us so we can update our post. *This shipping line also has Delta Fast Car Ferries for your roro needs. 6:00 AM – This departure time is only applicable every Monday. 10:15 AM – This trip is every Saturday only. Fast Craft fare is P160 per person, per way. Fare is subject to change; please call the Delta hotline for the latest ticket rate from Dumaguete to Siquijor and vice versa. On Delta Ferries Promos, we will announce them on this superferry website as soon as we know of them. When to buy ticket for Dumaguete to Siquijor and back? We suggest that as soon as you arrived in Dumaguete City, you make your way to port to buy the Siquijor fast craft ticket. The port is walking distance from city centre, you can also take a tricycle if you want to get to the Delta Booking office faster. This is to avoid the long queue especially for the first trip departures. When you get to Siquijor, you have the option to buy your return ticket right away or you will buy it couple of hours before your intended departure time from the island of fire. Outside the port, there are already lined-up tricycles accredited by the Philippines Department of Tourism. 4 to 5 persons can be accommodated by a tricycle. You can do a Countryside Town Tour for one day or two days to include Mountain Tour. Tariff Rates are printed on a tarpaulin for easy reference of everyone, it includes point-to-point fare. There is also a Tourist Assistance Center just outside the Siquijor City port gate in case you have queries or concerns. Alternative modes of transportation for visiting tourists are airconditioned vans, private jeepneys, multicabs. You can arrange a tour with your Siquijor hotels or preferred travel agencies. There are public jeepneys plying each town but they are rare. If you plan to tour the Siquijor Island, it is best to hire a tricycle for a full day use or van transpo. For those who will be bringing motorcyles, cars, bicycles, there are RORO Siqujior transport services that you can avail of like that of Delta Fast Car Ferries. Please watch out for new promo announcement for Delta Fast Ferries for 2015 and 2016. Kindly like our Facebook page for updates on promotions, news, schedules etc. Thanks!